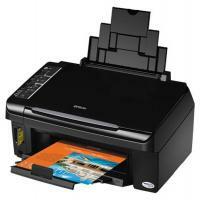 Epson with its model Stylus SX205 aims at providing excellent quality prints and scans at a very affordable cost. This printer is suitable for using at home and small office setups. The printer connects through USB and memory card reader which enables to print through your PC very conveniently though lacking networking capabilities. The maximum printing resolution provided by this inkjet printer is 5,760 x 1,440 dpi which results in extremely fine quality photo prints along with Epson Stylus SX205 ink cartridges which claim to give real life colours to the photos. The quality of scans compliments the printing quality by having a maximum scanning resolution of 1,200 DPI x 2,400 dpi. The printer supports paper sizes till A4. This inkjet printer has input tray with a capacity of approx. 100 papers and a dedicated output tray. The Epson Stylus SX205 has dimensions of 450‎mm in width, 342mm in depth and 182 mm in height having a weight of 5kg. With an interactive LCD and the moderate sized structure, Epson ensures the printer to be convenient for using at home. Epson Stylus SX205 is an all in one inkjet printer which provides the customers with high-quality prints and scans at an affordable price. The printers moderate structure enables it to be easy to manage at home and small spaces. Epson Stylus SX205 ink cartridges claim to give real life colours to the photo is an add on to the great printing quality. For users at home, students and small office setups this printer is a good deal to avail. Q. The paper sold on the official website is too expensive. Is it necessary to only use the media recommended by the printer company? A. No, you can use paper sold from any company as long as the printer can handle the media type. You will find a range of paper media suitable for your printer on our website as well. Q. I have noticed that my Epson Stylus SX205 printer has been producing poor quality printouts. What should I do to fix this problem? A. You will need to clean the print head to improve the quality of the printouts. You can simply do this by holding down the "Stop" button for 3 seconds and the printer will automatically perform the cleaning process. If the print quality does not improve after 4 times of cleaning the print head, turn off the printer for 6 hours and try again. If the quality still does not improve, try replacing the Epson Stylus SX205 ink cartridges and try again. Q. Is the Epson Stylus SX205 printer PictBridge enabled? A. Yes, Epson Stylus SX205 printers come with PictBridge support. This means that you can directly print photos from a camera without requiring a computer. Just make sure that the camera also supports PictBridge. Q. Are Epson Stylus SX205 ink cartridges replaceable individually? A. Yes, Epson Stylus SX205 printers come with a 4 ink cartridge system, which allows the user to replace only the ink cartridge that has run out. This feature enables savings as you only replace the colour that has run out, thus avoiding wastage. Q. Is there any replacement or refund policy if the Epson Stylus SX205 ink cartridges received are damaged? A. Yes, we will provide a refund or a replacement for you if the items you order from our website are defective. Simply, call us on 048 308332211 or email us on info@printerinkcartridges.ie regarding the issue within 30 days of receiving your product. Just have your order details and invoice number ready and we will guide you through the process. Q. What kind of damage can a compatible Epson Stylus SX205 Ink Cartridge will do to my printer? A. Compatible cartridges provide by this site have the same specifications as the OEM (Original Equipment Manufacturer). A small possibility might exist for any cartridge to leak ink into the printer causing unwanted stray marks on the paper. Having the printer cleaned and replacing the ink cartridges will easily correct this. It is unlikely that an ink cartridge will damage the printer itself. Q. From where can I buy the compatible Epson Stylus SX205 Ink Cartridge on this site? A. To place the order for the Epson Stylus SX205 Ink cartridges, you can select the product from above on this page and add it to your cart. Once you’re done with adding the items in the cart can proceed to the checkout. Q. Will my Printer warranty be affected if I use remanufactured Cartridges with my Epson Stylus printer? A. No, your warranty will not be affected. OEM have clearly written, that the warranty is not void if you use refilled or remanufactured cartridges. Only if it is proven that the remanufactured cartridge can cause damage to a printer part, then they can refuse to repair that part. Q. What are the dimensions of Epson Stylus SX205 Ink Cartridges? A. The Epson Stylus SX205 has dimensions of 450‎mm in width, 342mm in depth and 182 mm in height having a weight of 5kg. This printer is suitable for use at home and small office setups. Q. How fast will you deliver my product if I order the pack of cartridges from this site? A. All our orders are delivered by Fastway Couriers and require a signature at the time of delivery. Approx 90% of the orders received before 12 noon daily are despatched same day and delivered on a next-day. Maximum it takes 1-2 business days to deliver your product. If your order is urgent, you can call us at 048 30833221 to check the stock.